Working with teachers the last Wednesday before the break, we went over any of their SMART software questions, then in the afternoon started to look at other Web 2.0 tools that they could use. Global Collaborations - Looked at a few Ning groups and at CAPSpace which I've used to connect a few techers. File storage - They were all over the place, so we talked about Box.net and our BOCES storage, then I just shared my delicious links. iPod help with iTunes and also using their voicerecorder. Jing Project to get screen captures- Which I love and used for the screen captures below, plus, a host of other ideas. and websites. 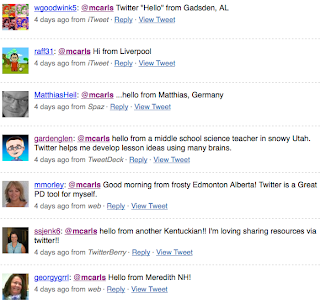 The most interesting part for me was when I mentioned to these teachers that I was using Twitter to answer most of their questions. Quite a few had heard of it, and I tried to explain it......tried being the key word! 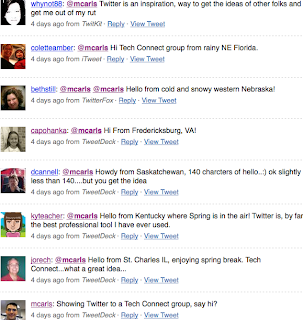 Then, I asked my Twitter network to say hello (which I've seen many times, but rarely done). Below was the results and they were floored....plus, thinking I was even geekier than before! 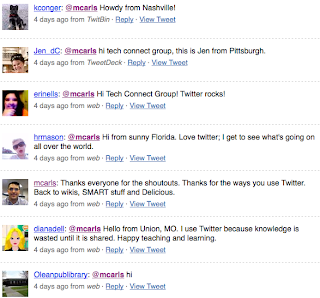 Thanks to everyone for helping show how I learn and the power of having a network.